Really easy to complete, just go to the inns listed on the achievement. Here's a map, making it a wee bit easier to plan your route! I cannot find the one in Shattrath City, even with cords. Where am I supposed to be looking? On Hellscream-EU the Area 52 one is bugged as of 2009 10 18. You can not pick up the quest. Same problem on Feathermoon. I haven't done this lat year, so it's most likely just bugged. Interesting thing to note, I saw some people get the quest and walk away with their Hallowed title. I'm not sure if it's person specific or what. Weirdness. Problem is occurring on Skull Crusher Alliance side... Hope they fix it. Area 52 is working today. If you're neither Scryers or Aldor, go to the Aldor one. I can confirm that Area 52 (on Zangarmarsh) is glitched but only situational.... I could not click on the bucket but another player right beside me got it. I've placed them in the order I fly to them which seems to be a pretty optimal route. list of the items I picked up. Good luck and happy haunting. It's worth noting that unlike the other "Tricks and Treats" achievements, where there are some unlisted Candy Buckets, all Candy Buckets in Outlands zones are listed in this achievement. Catacylsm (Alliance): No unlisted Candy Buckets. Outlands (Alliance): No unlisted Candy Buckets. Northrend (Alliance): No unlisted Candy Buckets. Sorry, but I won't be posting Horde ones as I only have an Alliance character. However, this Innkeeper NPC list (http://www.wowhead.com/npcs?filter=rh=1;cr=23;crs=1;crv=0) should be helpful for Horde characters. Hint: use the "Search within results..." box to filter by zone. This way when you have the item in your inventory it will show lit while when you don't it'll be darker. Just bind it to an easy to use bind and you're ready to go! If anyone was wondering, you truly can only obtain candy from the Scryers OR the Aldor inn in Shattrath/Shadowmoon as stated in the criteria, even when you're still neutral with both factions and thus able to visit either inn without problems. Picking up candy at one inn (it doesn't appear to matter which one you go to if you didn't choose a faction) also renders the other inn's candy bucket unclickable as if you had already gotten a handful of treats from it. 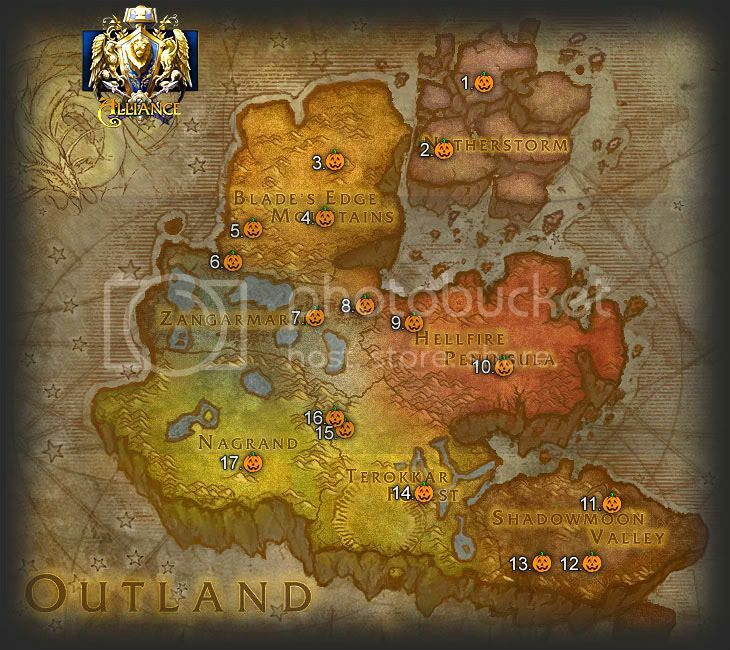 If you loot ALL the buckets from all the zones - Eastern Kingdoms, Kalimdor, Oultands, Northrend and Cataclysm - including the ones not specifically listed for the achievements, at level 85 you will net 800+ GOLD... and that's after you pay for all that taxi service! This has to be the easiest gold you can make in the game - no mobs and no repairs. Just collect your candy and your gold! Make sure to equip your 尊崇公会战袍 so you can double your guild rep as you collect your loot! A handy thing to have in your bags is 万圣节南瓜糖, if you get tricked (40sec cc) from the candybucket, eat one and you will get a new disguise that overrules the one from the candybucket. This new disguise can be removed if you wish. 万圣节南瓜糖 are sold by 卡提娜·闪星 outside Ironforge Bank, you need to have completed 耶斯帕尔的万圣节糖果！, if you havnt she will only sell normal candy. They stack to a 100, should be enough that even those who are hated by rng wont run out before they are done by the achivs. How easy it might be, it still takes several hours getting to all the buckets. People that aren't interested in the achievement but are looking to make some gold, there are other and much better ways. Coords taken from jwiegley's post, simply /way-ified and tested to be under 255 chars. Since you cant have more than one 一把糖果 in your bag, you'll have to open it again and again..
You cant pull it out on your action bars, so you need to go into your bag everytime you collect one, which get annoying pretty fast.. But no fear, the macro is here! Here's a map to plan your flight route. Note: Shadowmoon Valley contains two pins (the easternmost pins), one each for Altar of Sha'tar (Aldor) and Sanctum of the Stars (Scryer). You should only visit your chosen faction. Note that since patch 6.0.2 dropped and you're using the TomTom coords, the Shadowmoon Valley ones will appear on Draenor 影月谷 as there's now two zones with the same name! note: Can be assigned to a single macro with an addon like Macro Toolkit. Tomtom waypoints for Other zones: additional Alliance / Neutral Candy Buckets. Protip: Easy macro for Opening your treats without opening your bags. I realize that all the points have already been listed, but I'm going to list them again in the order that I'll be doing them because I've already done all this work, I might as well share. It seems to me to be the most efficient way to do it all in one go. Feel free to offer better ways. You'll need an addon like Paste to put it all in one place. Check out the other achievement pages for their continent's routes. On This Achievement 外域的糖果 you need to finish quests with in 15 locations. All of them You can find in Inn in main Vilages/Cities in 东部王国. This Achi is part of 艾泽拉斯的糖果.